Is Poker a 'Mind Sport'? What is up with Carlsen? And the winner is .... Tromso! The "form slump" that Magnus Carlsen seemed to be going through is seemingly over, just as quickly as it began. While his 7/10 at this years Pearl Spring tournament wasn't as dominant as in last years event, it was still enough to finish comfortably ahead of the rest of the field. He also seems to have regained his drive to maximise his tournament scores, pushing for a win in the last round against Gashimov, despite having already won the tournament, and the position being drawn anyway. The other 2 players who would be pleased with their tournaments were Anand and Bacrot. Anand finished second on 6/10, which was a good tournament performance for a player whose major focus over the last few years had been match play. Despite ending up on 50% I am sure Bacrot would be happy with his play (well maybe not the last few rounds), as he was considered a favourite for the wooden spoon. From the "it's a funny old world" files comes the following story from New York about chess boards. Chess players know the 'white on right rule', but they also know that non chess players will get this wrong 100% of the time. Why this is so is still a mystery, given the laws of probability predict that it should only happen 50% of the time. In the case of the New York chess boards, not only were the the wrong way round (ie 'black on right') they were boards that were painted onto the tables! Fortunately the error was reported to the relevant authorities, and the mistake quickly rectified. November is just a few days away, and that means it is almost mo growing season once again. I've once again signed up for Movember, despite knowing that it will once again be a month no love. You can see last years effort in the photo to the left, but I think I will try for something different this year. So on the 1st of November the current picture is coming down, to be replaced by a clean shaven me. Hopefully by the end of the month I will have grown a worthy replacement. In the next few days I hope to have my Mo page up and running, so either watch this blog or my twitter feed for information on how to donate. Due to favourable time zones, the Pearl Spring tournament is part of my early evening entertainment. Of course in these modern times, it is part of a wide array of things done almost simultaneously, such as cook dinner, watch TV, talk with children and waste life on World of Warcraft. So I tend to dip in and out of the coverage from Nanjing, rather than follow it continuously. One thing I've avoided while watching the game is to have a chess engine running while the games are in progress. In doing so it makes the games a little more spontaneous, with certain moves coming as a real surprise, rather than as a second choice according to Fritz. 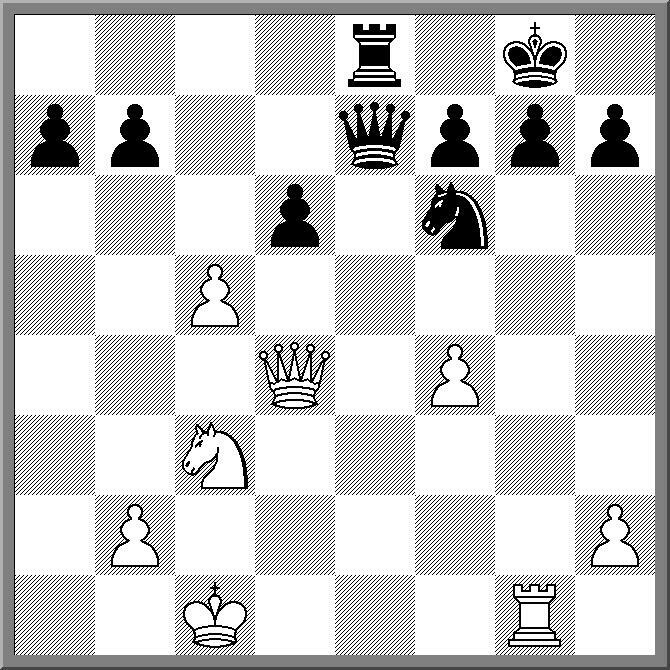 An example of this was tonights Anand v Topalov game. Topalov decided to sac on f2, which was a small surprise, but it was his decision to not try and win the piece back straight away that was a bigger shock. It turned out that the whole game was a bit of a tactical slug fest, with Topalov eventually taking the perpetual check. I'm sure Rybka might decide the whole thing wasn't perfect, but for me it was great to be an (uniformed) spectator. Back in 2008 I posted a summary of the Rules and Tournament Regulation Committee meeting at the Dresden congress. In this report I stated "Nonetheless there were also occasions were essentially the chairman (Geurt Gijssen) had the only vote, simply by passing over a contentious issue." When I met up with Gijssen at the 2010 Olympiad he raised an objection to what I said, believing that he had been unfairly painted as "undemocratic". Looking back at what I wrote, I accept that he raises a valid point, as I provided no evidence to support my statement. So I'm happy to correct the record on this one, and retract any suggestion that he acted in an "undemocratic" manner. Apart from being the father of positional play, Wilhelm Steinitz was also noted for some eccentric opening choices. 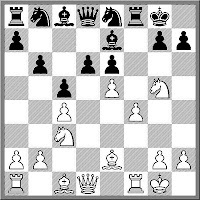 The Steinitz Gambit (1.e4 e5 2.Nc3 Nc6 3.f4 exf 4.d4 Qh4+ 5.Ke2) is the most noted of these, normally with the quote from Steinitz "The King is a fighting piece" attached to it. What I find surprising is that Steinitz would be attracted to this idea, given a game that occurred early in his career. Before he became the position player we know today, and while he was still working at being "The Austrian Morphy", he played the following game against Carl Hamppe. 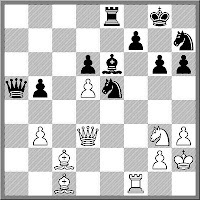 Like the Steinitz Gambit it started as a Vienna opening although it was a little more mainline. That is until Hamppe decided that a pawn was worth having his king chased up the board. Eschewing some sensible defensive moves (such moves "would have been considered shameful" according to Lasker), he quickly found himself in trouble. So much so that Steinitz was able to produce a spectacular sacrificial finish. It might not be another super strong all GM extravaganza, but the 2010 World Seniors Championship is a pretty big (and important) event in its own right. It gets under way tomorrow evening in Arco, Italy and has attracted a field of over 250 players (245 in the Open, and oddly, 30 in the Womens). Oceania is represented in both events, with 3 Australians (Brian Jones, Lachlan Benson and Oleg Korenevski) in the Open, joined by 2 New Zealanders (Paul Spillier in the Open, and Viv Smith in the Womens). Back in the old days, when the top chess tournaments were huge affairs consisting of 16 or more player round robins, cleaning up the back markers was a vital part of winning the event. In part this was because the field often consisted of a 3 or four leading contenders, a solid middle, and 3 or 4 player who were there as a favour to the organisers. And if you didn't beat the bottom four, then you could be sure some one else would. These days the top tournaments are more of a cosy little club, with the 2750+ players meeting 3 or 4 times a year, and no real cannon fodder at the bottom. However the strategy of pounding on the back markers hasn't really gone away, as shown by the current tournament in Nanjing. At the halfway point Carlsen is well and truly in form, score 4/5, with wins over Bacrot, Yue, and Topalov. However the suprising second is Etienne Bacrot, who before the event might well have been the main target for the other 5 players. After starting with 0.5/2, he has won his last 3 games to be half a point behind Carlsen. Anand is sitting on 50% while the other 3 players are in negative territory. The second half of the tournament may become a real struggle for Topalov and Yue, as the other 4 players look at picking up vital points from the stragglers. The 2010 Vikings Weekender will be held on the weekend of the 20th and 21st and 22nd of November. Once again it will be held at the Vikings Rugby Union Club, Ricardo St, Waniassa, ACT. It will be 7 round event with 4 rounds on Saturday and 3 rounds on Sunday. The time limit will be 60m+10s per move (Fischer). Entry fees are a very affordable $60 standard, $40 concession and $40 for juniors. This years sees and increase in prize money with first prize now $750 (an increase of $250 from last year). This event has always been a popular end of year tournament, with close to 60 players taking part in each of the last two years events. You can enter the tournament online at http://tinyurl.com/2010-Vikings while the tournament flyer is here. Round 3 of the Pearl Spring tournament saw three decisive games, with wins by Carlsen, Anand and Bacrot. While the win by Carlsen (against Wang Yue) seems to indicate he is back in form, it was the win by Anand over Topalov that was the most fascinating. If you play through the game, you will notice some similarities to their final game from this years World Championship Match. 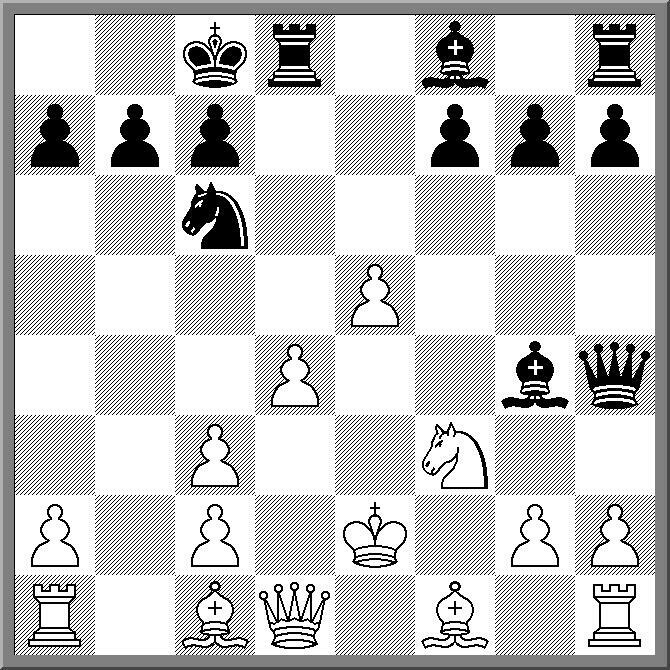 Then as now Anand had the black pieces, and this game began with the same variation (up until move 9). 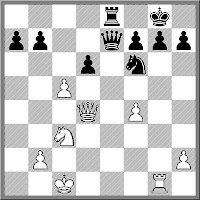 Despite taking a different course after that Anand still managed to drag the White king to h4, where in this game it perished. I haven't seen the post game comments, but I'd hazard a guess that Topalov would not be happy about being hit by lightning twice in a row. I had an interesting game last night, where early on I 'blundered my pawn structure'. What I mean by this is that due to a poor move I let my pawn structure be damaged, rather than giving up material. 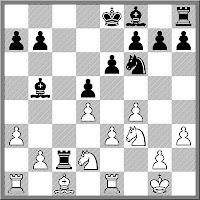 When looking over the opening variation later I discovered that it might not have been such a bad idea at all, given that the same variation was played by Alexei Shirov against Vassily Ivanchuk in a rapid game back in 1996. While the game I played isn't worth publishing (although I won), the Shirov v Ivanchuk game is. It seems that the worlds leading players have been put to work by some kind of higher power. Today sees the start of the Pearl Spring tournament in Nanjing, a week after the Grand Slam final in Bilbao was completed. Backing up from that event are Carlsen and Anand, while Carlsen(! ), Topalov, Yue, and Bacrot played in the Olympiad less than 3 weeks ago. The only player who is completely rested is Vugar Gashimov, although his rest from the Olympiad was not of his choosing. As the event is being held in China, the games are being played in the early evening, Canberra time. This means a visit to http://www.chess-pearlspring.com/www/chess_pk/2009/en/ will give you the live broadcast of the games, along with other info (NB Ignore the 2009 in the URL, the link covers the 2010 tournament). The only decisive game of the first round was a win by Carlsen over Bacrot, with the other 4 players taking a half. Who do I think will win? I'm going to go with my usual pick for these sort of events and say Carlsen, especially given the confidence boosting first round win. Second may well be Topalov, with Anand playing a little more conservatively post Bilbao. Chess players have money, at least enough to live on. And some chess players have more than that, especially to spend on things like books and software, for themselves of course. The challenge for tournament organisers (and even chess federations) is to try an redirect some of that money into the wider chess community. The most obvious way is to organise tournaments that players want to play in, but from my own personal experience this is always a close run thing, with 'expected' prize funds always more than players are willing to fund. (Although I will say that there have been a few tournaments I have been connected with that now seem to be slightly ahead of the curve). A slightly more subtle model (and possibly a more successful one), is to package your product as a 'service' rather than an item. An example of the success of this approach is FIDE, and the income it generates from rating fees. While there are concerns about prize funds for World Championships etc, FIDE do generate enough income to fund its day to day operations, built in part on the money collected from tournament registration and rating fees. I suspect the incremental nature of these charges (for organisers at least) is one reason for people being willing to pay. Retailing equipment (for national federations) is also a kind of service, especially in areas where there isn't large commercial supplier. Botswana is one federation who built up its resources by retailing sets, using its built in advantage of being the official chess body in the country. I've even seen non-federations use this model, with at least one Australian coaching business marketing their own brand of equipment. Finally, the pay as you go model can work for clubs. Instead of trying to hit up members for a large membership fee (which hey tend to complain about no matter how small it really is), charging a small amount on a per tournament/night basis may give a larger return in the long run. Of course for this to work, you do need to make sure your customers keep coming back. From the earliest stage of my chess career I kept a record of my games. The first 50 or so games were in a score book, the rest on tournament score sheets. Unfortunately (and despite the best efforts of my wife) I mislaid the vast bulk of my score sheets (They are either buried under vast piles of paper in my study/garage, or were left in the boot of my Torana, which was sent to the wreckers 20 years ago). At least the early games survived, and to this day have their uses. As the chess played was of a fairly basic variety, I use them when coaching new players to demonstrate both the advantage, and disadvantage, of following basic chess principles. 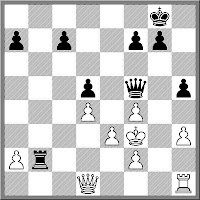 For example the following game is an example of the opening 'hack' where I happily sacrifice my pawns in the opening in return for an attack against my opponents king. 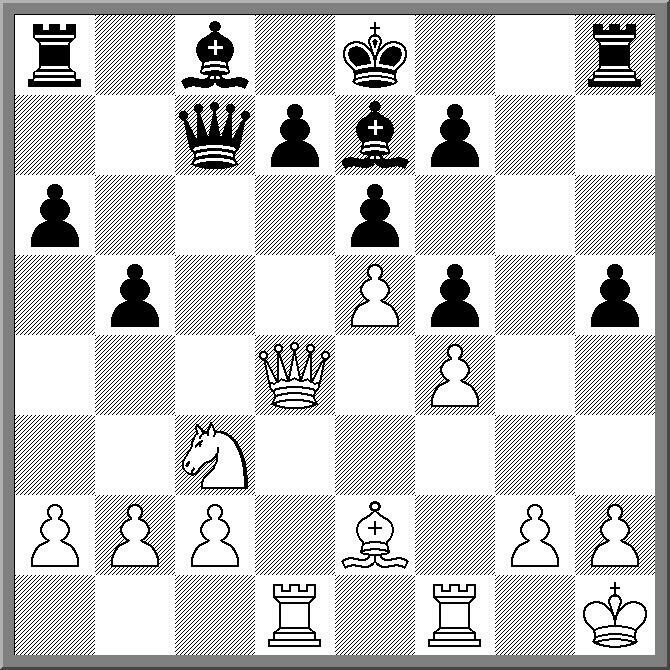 Clearly it isn't perfect chess, but it is 'obvious' chess and as such is easy to explain. Over the last decade the European chess scene has kicked on pretty strongly, with the European Chess Union creating a number of very popular events. One such event is the European Club Cup, a kind of Champions League of European team competitions. While the big names form the Bundesliga or the Russian teams championships are at the top of the field, 'minnows' from the Welsh and Irish leagues are also represented. There are a number of big (and familiar) names taking part, including Ivanchuk, Gelfand, Aronian etc Showing how strong it is, Alexi Shirov is on Board 4(!) for the top seeds SOCAR Azerbaijan. The official site http://ecc2010.chessdom.com/ is carrying live coverage of the tournament, though not all games it seems. However the selection clearly favours the 2600+ GM clashes with Michael Adams v Dejan Bojkov one of this evenings games. I'm keeping an eye on the event, not so much for the top end, but because I support (yes you can support chess teams) White Rose, who sit somewhat further down the tree. But teams chess can throw up some upset results and I'm hoping this will be the case this year. One thing we didn't really get in Siberia during the Olympiad was snow. There were a couple of brief flurries but that was about it. Which was shame as I really like snow during chess tournaments. So when I woke up this morning I was pleased to see it was snowing here in Canberra. Not a lot of snow, but more than I saw in Khanty-Mansiysk. As snow is relatively rare in the Australian capital (light falls every couple of years, heavy falls once every 5 years) I took this as good omen for Street Chess. In fact I was happy to take the whole chess/snow thing even further, planning to play outdoors, but a mutiny by the regular players forced a change of venue to warmth and cover. But the luck brought by falling snow held and I was able to win a number of good games, including this win over fellow Olympiad player Emma Guo. The principle of two weaknesses is (I assume) fairly well known. Normally a defender has enough to hold one weak point in a position, but protecting 2 or more is often too much. For attacking players, the principle of two targets is a similar idea. If you have at least two distinct targets in a position, then you can be pretty sure your attack is going swimmingly. The following game was played at my club last week. Black has made the cardinal sin of playing passively in the opening, and as a result White has a lot more space to work with. 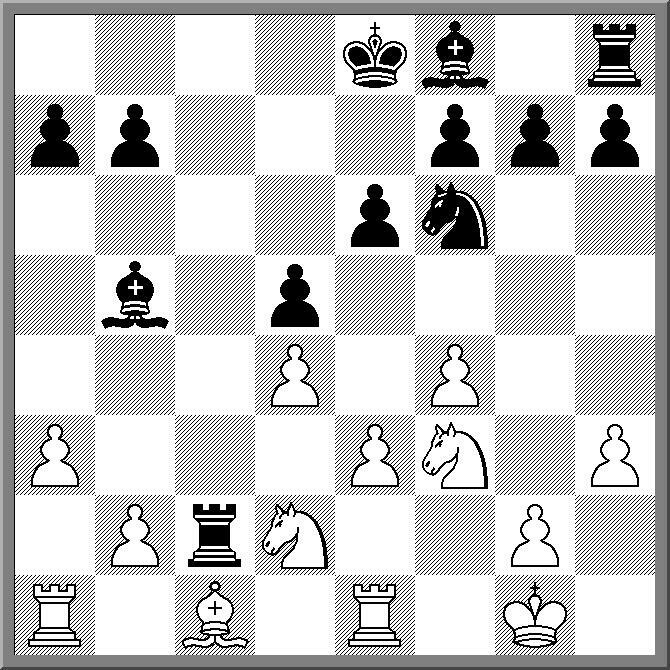 In the diagrammed position White can target either the rook on a8 (with Bf3) or the King, with Nxh7. 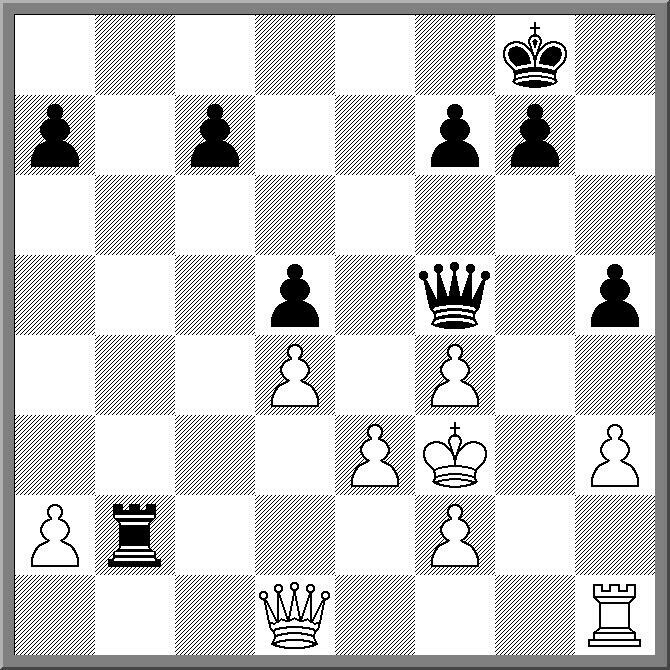 White found the mating attack a more attractive option, and after the sac on h7, Black's resistance crumbled. My daughter introduced me to the term "the Ipod generation" a couple of weeks ago. It obviously refers to the current generation of kids/teenagers who having access to electronic content (via the net/mobile phones) is part of their everyday existence. Now I'm not sure if the term "the bullet chess generation" has already been trademarked, but it may be applicable to the current generation of young chessplayers. 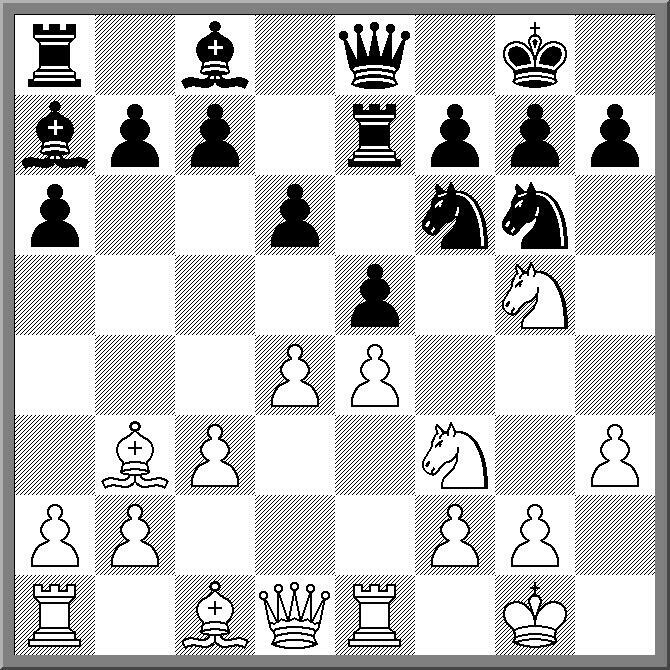 I know of a number of young players who have sharpened their skills with this form of chess, and have even included a couple of games on this blog. Now it is my turn to dip my toe in the bullet chess pool. Up until now I've never really done well at this form of chess, but over the last few days I've actually played some interesting games. Quite possibly the difference is what sort of interface I use, as I seem to find the Chesscube interface easier to use than my previous experiences with Xboard/Eboard. In the following game it also helped that I was able to bang out a huge number of semi-remembered moves in the Marshall, but a win is still a win! Great excitement in the world of Shogi (Japanese Chess) when Japanese Pro Ichiyo Shimizu was beaten by the program Akara 2010. This is the first time a computer program has beaten a pro in a serious game. For those not familiar with Shogi, it is similar to chess, with an element of Bughouse thrown in. Pieces that you capture actually become part of your army, and can be dropped on the board (subject to restrictions) in place of moving a piece. This makes the game more complex than chess, at least in terms of search space, as a program has to not only generate moves but also examine 'drops'. One of the interesting aspects of this match is that it actually took place at all. Previously the Japanese Shogi Federation has stopped human v computer matches involving its members, threatening players with sanctions of they play such a match without permission. There are a number of stories on the web about this match, including this one. Does Poker qualify as a 'Mind Sport'? If membership of the International Mind Sports Association (IMSA) is a qualification, then the answer is "Who knows?". Earlier this year there had been rumours that the next World Mind Sports Games had secured a lucrative sponsorship deal from an internet poker site. Obviously part of this deal involved poker being part of the WMSG, although the poker format was described to me as 'Duplicate Poker'. This was to remove the luck element from the game, meaning it met the IMSA definition of a 'Mind Sport'. It seems these rumours also reached the poker world, as there seemed to be quite some excitement that poker has been recognised as a game of skill. However, follow up reports suggested that this excitement might have been a little premature, as IMSA was yet to actually approve pokers application. Now it turns out that the application may be held up for far longer. Apparently the statutes of IMSA require the unanimous consent of the existing members for a new member sport to be admitted. And in the case of poker, it is actually FIDE that is digging in its heels. The concern, as explained to me, is that no matter how you sugar coat it, poker is essentially a gambling activity. And it is this feature that makes poker unacceptable to a large number of FIDE member federations. So for now organised Poker does not have a seat at the IMSA table. As for the sponsorship deal for the next WMSG, I'm assuming that is on hold as well. During the recent Olympiad I was having a discussion with someone connected with another team about how I was going in the tournament. I gave the usual litany of excuses (lack of openings, no pre-tournament preparation etc), and he chuckled. "Of course" he said. "After the olympiad the players from my country always say how they are going to spend the next two years working on their openings, improve their endgame technique, and play a lot more serious chess. This plan lasts about two days after they get home, and then their real lives take over"
I recognised the truth of this statement, as it pretty much matches my own experience. But it doesn't mean that there is nothing to be done at all. For the moment I am still sticking to a plan of grabbing a couple of classics (eg "My System") and at least playing through the games in the book. 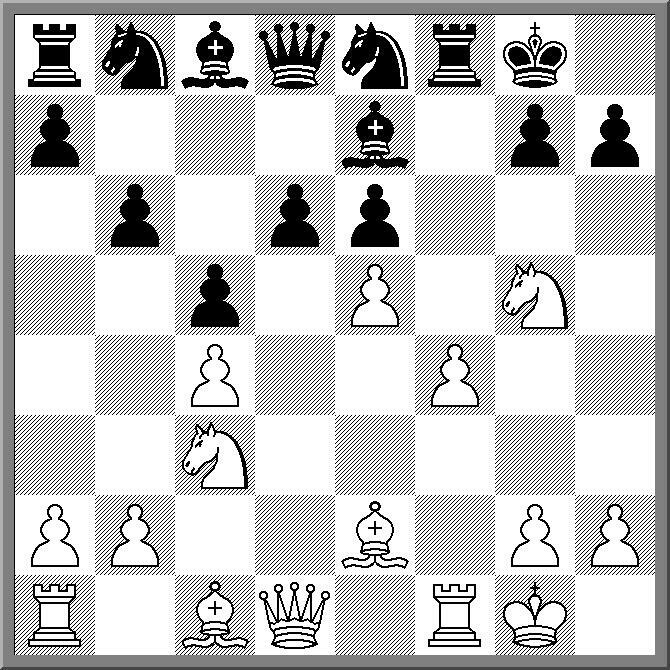 For example the following game is about (a) control of the open file and (b) entry points on the 7th rank. I have a lot of admiration for Magnus Carlsen, an admiration that only increased during the 2010 Olympiad. He could have ducked the event like a certain World Champion, but turned out for the Norwegian team, knowing that his team wouldn't be challenging for the medals, and he would most likely be up against a different set of opponents than he normally plays. He was even a team player off the board, travelling to the Olympiad on the same charters as everybody else, and lining up in the freezing cold to get into the Bermuda Party, amongst the hundreds of other punters. Unfortunately it wasn't a great Olympiad for him, losing 3 games and finishing with a 2664 TPR. And it seems his run of form hasn't got any better, with a crushing loss to Kramnik in the first round at Bilbao. Kramnik seemed to get a simple advantage from the opening, and attempts by Carlsen to break the hold that Kramnik held, only made things worse. By the end of the game Carlsen was reduced to shuffling his c-rook, and resigned rather than submit to a slow and painful death. After a week of Olympiad recovery, for players and fans, the 2010 Bilbao Masters kicks off tonight. 3 of the 4 participants (Carlsen, Shirov and Kramnik) have come from Khanty-Mansiysk, while Anand used the previous 2 weeks for rest and preparation. This years event is a 4 player double round robin using the time limit of 40 moves in 90m followed by 60m and a 10s per move increment from move 41. Sofia rules on draw offers is in effect, and the 3-1-0 scoring system is being used. Live coverage (including live video) is available from the tournament website. The only downside, the round times mean a 1:30 am start for fans following the games from eastern Australia. My tip for victory: The well rested Anand. Interestingly I witnessed Ivanchuk being asked to go to doping control at this Olympiad (as I had done in 2008), but this time it was done without the same drama. Maybe because Ivanchuk had just won his game, or because medical commission member Jon Speelman was making the request, but Ivanchuk seemed happy to comply. So at least there is now a more nuanced approach to the drug testing issue although my position is still that it should not be there at all. While I was dividing my time between playing and working* at the Olympiad, I did try and keep an eye on the Australian team. At times this was easy as they were often in the same playing hall as PNG (of course on much higher boards), and it was only a short work walk to their boards (both Open and Womens). Both teams finished on their seedings (the women a little bit higher) and all the players performed at around their pre-tournament ratings (maybe up or down a few points). For the women the tournament may have been a little tougher as they seemed to get caught in the swiss 'bounce'. Apart from close wins against Turkey and New Zealand, they were either winning big or losing big, and such dramatic shifts in the strength of opponents can make match strategies difficult. The Men's team had a bouncy start, but after round 3 didn't score less than 1.5 in any match. Their best win was in round 5 over 31st seed Moldova, but it was drawn matches against lower seeded Mongolia and Singapore that stopped their drive for a higher placed finish. In terms of the 'B' Olympiad both teams put in a disciplined performance with team captains Manuel Weeks and Leonid Sandler making sure that the 'A' tournament was a priority. Occasionally I would spot them in the bar at the Olympic Hotel after the round, but it seems their curfews were set much earlier than mine! Made it back to Canberra this morning, and even squeezed in a day of work and an evening at the chess club before sleeping in my own bed for the first time in 2 and half weeks. Interestingly Brian and Jones and myself took an overnight flight from Dubai to Sydney, which meant I had to spend a night in Sydney before making my Canberra connection in the morning. David Smerdon decided to spend a night in Dubai and then take a morning flight from Dubai to Sydney. It turned out that we were on the same connection back to Canberra this morning, so it boiled down to a night in Dubai versus a night in the Sydney Airport El-Cheapo Hotel. I fear I got the bad end of that deal. So now I'm getting back into my regular blogging routine, which is usually the last thing I do before I go to sleep. But not tonight. I've got a pile of photos on my camera from the last couple of days, so before I go to bed this evening I will upload them to my picture site. Currently relaxing at Dubai International for a few hours, while waiting for a 1:40 am direct flight to Sydney. I've run into a couple of African teams (eg Botswana) who are also heading back. In fact I've seen a number of people (well 2 at least) wearing the Olympiad souvenir t-shirts here, and I assume this means their down to last clean change of clothes. While wailing away the hours I've put my mind to a problem posed by newly minted Mauritian FM Roy Phillips (7/10 at the Olympiad! ): Out of 12 balls, identical in appearance, one is of a slightly different weight to others. You have a set of balancing scales. How do you find the (a) odd ball out and (b) determine it is either heavier or lighter than the others, using the scales only 3 time? He says he eventually solved it but for now I don't have an answer. 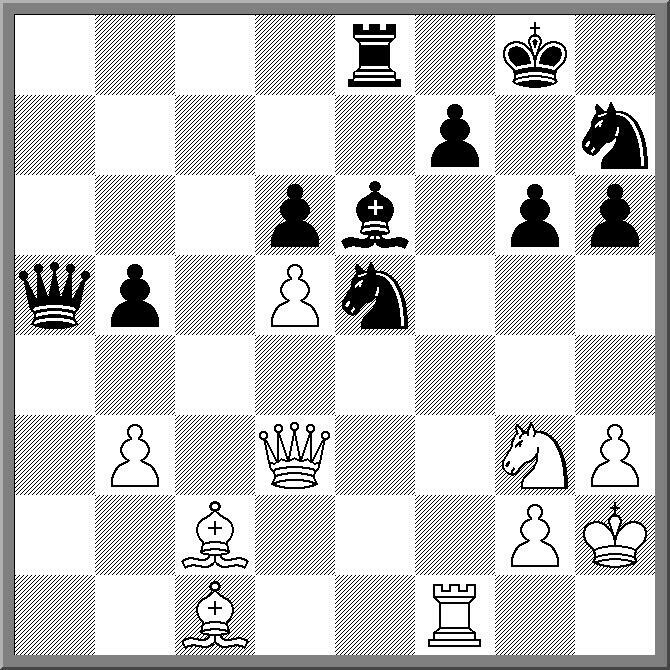 PNG finished the 2010 Chess Olympiad on a high note, with a 4-0 win over the US Virgin Islands. In fact this is the first 4-0 for PNG since 1986 (not counting the default in the last round in Dresden 2008). It means that we end up on 6 match points (down 1 from 2008) but with 18 game points, which is 2.5 up from 2 years ago. Due to our 'submarine' strategy we actually stand a chance of overtaking a few (better performed) teams. Helmut Marko was the first winner today, and his score of 5.5/11 qualifies him for the CM title. I also managed a win, my first of the tournament! Too late I realised that instead of winning pawns and then failing to convert, my strategy should have always been to sacrifice a pawn, and then use the extra space to attack. Tonight sees the closing ceremony and tomorrow the teams head home. It will probably take me about 40 hours to get back to Canberra but I will try and post en-route. The big event on the second rest day was the decision on who would host the 2014 Chess Olympiad. There were 2 bidders, Albena in Bulgaria, and Tromso in Norway. Both bids had a number of positives, with Albena emphasising its charms as a tourist resort, while Tromso stressed its natural charm and government backing. I wandered across just as Albena made its presentation (having missed the Tromso one) and then listened to a brief Q&A. Just as I was minding my own business, I was suddenly nominated to be one of the three election officials tasked with managing the vote. This involved myself reading out each of the countries eligible to vote, Alan Herbert(BAR) handing out the voting papers, and Carol Jarecki(BVI) supervising the voting booth. When each of the 142 votes had been made we retired to the counting room, accompanied by one observer from each of the bid. Making sure such elections are on the up and up, is quite an involved process. Each voter signs when they take a ballot paper (to verify their credentials), and each ballot paper is signed by an election official (to prevent forgeries). Then we check that the number of ballots collected match the number of ballots anded out, before we even begin the count. In the end both bids were quite exciting and while I am looking forward to Tromso in 2014 I hope that Albena returns in 2 years time to bid for 2016. Finally the 'submarine' strategy of the PNG team might be paying off. Having played the swiss gambit deep into the tournament (1 win in the first 9 rounds), we ended up in the 'wooden-spoon' playoff match against the Seychelles on the bottom board. It is pretty random stuff done the far end of the hall and my game as white started with 1.e4 d5 2.d4! dxe 3.Nc3 e5! 4.Nxe4 Qh4! According to my database this is indeed a novelty, and possibly not a good one. Certainly after 5.Ng3 e4? 6.Qe2 Nf6 7.Nf3 Qg4 8.h3 Qe6 9.Ng5 Qd5 10.N5xe4 I was just up a pawn (with a better position as well) but in a depressingly familiar reply of most of my other games in this tournament, I played a couple of poor moves and the game ended in a draw (my 6th so far). The other 3 PNG players had less trouble than I did, all recording wins, and so we scored our second match win and picked up another 3.5 game points. I suspect that our final opponents may well be US Virgin Islands, as they have no one left to play, and while on paper we should be favorites, PNG did lose to them in 2002. With the FIDE elections over, it was back to the chess. PNG had another narrow loss, this time losing to Sierra Leone. We lost 2.5-1.5, leaving us planted firmly at the bottom of the table. Of course if you look at game points rather than match points we are actually ahead of a number of teams, but of course this isn't how the Olympiad is scored these days. drawn K+P ending, which I took. The diagrammed position was reached after all 4 rooks had been exchanged down the f file. It is now drawn but I decided to take the shortest path to that goal.